Splendid figure of a bull moving. 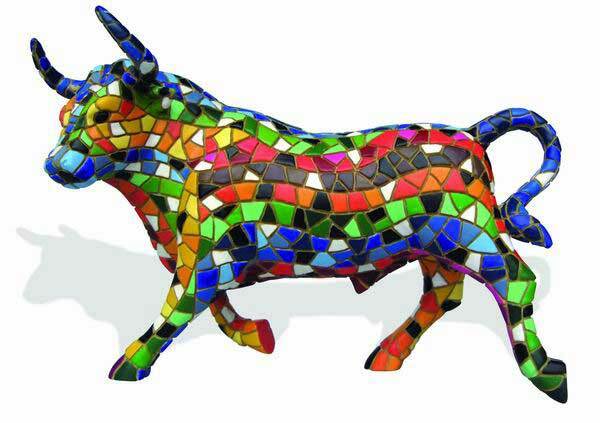 This multicolored bull of Barcino is pure spanish handicrafts. All creations of Barcino are hand painted and each of them is, therefore, a unique collector's item. It is made by craftsmen who made the figures with mosaic technique trencadís. My son brought me one of your bulls when he visited Spain last summer. Unfortunately, he, um, jumped off the counter and broke his legs off. Love it so much I had to replace it! Shipping cost to US was more than the cost of the bull itself, but worth it. I love these figures, especially the bull. What is the approximate charge for shipping to England.